What does success look like? For the BDA this month, it looked like the smile on the face of former resident Eric Bertrand when he confirmed he was completing the process of opening a new Bermuda office for his global fund administration firm, Centaur Fund Services. Centaur already administers $12 billion in New York, London and Dublin. After watching Bermuda’s resurgence in the asset-management sector, Bertrand feels the time has never been better to make our jurisdiction the focus of his company’s expansion plan. For him, it meant returning to the island he loved living and working in for a dozen years until he left for Ireland in 2009. For the BDA, it was the full circle of a larger journey we began more than three years ago. In May 2013, our agency hosted an asset-management think-tank in Bermuda for key influencers from New York City and Chicago. We invited them around a table with representatives from government, the regulator and industry to hash out exactly what was needed to make Bermuda more competitive and attractive for fund launches, fund managers and supporting companies. Fast-forward to 2016 and the global marketplace is starting to appreciate that we’ve got our mojo back. After those 2013 talks, Bermuda acted collaboratively and nationally to augment and re-package our fund offerings so decision-makers like Bertrand would put us high on their consideration list. We updated the Investment Funds Act, creating cost-effective new fund categories more in sync with today’s regulatory realities. We took that message back to the marketplace and after a period of cultivation, awareness, education and persuasion, are now seeing an uptick in fund business. The resulting strengthening of Bermuda’s asset-management sector has seen the likes of EFG International, Scepter Partners and Invictus RG setting up a physical presence on the island in the past 18 months. Companies that provide essential services to fund managers—such as Walkers, Harneys and now Centaur—have joined them. And that’s just the beginning. There are several more managers and service providers registering companies, incorporating new fund vehicles and establishing operations this year. Among them are household names—some of the world’s leading allocators, who have now made Bermuda their jurisdiction of choice. We have worked long and hard to attract them back to our shores, and it is an incredibly positive message for this industry. Kudos must go to the Bermuda Monetary Authority [BMA], the government, and the island’s established asset-management industry for spearheading the needed evolution and supporting a fund-friendly environment. In particular, the legislative and regulatory work done to help Bermuda meet European standards for island-based alternative investment fund managers [AIFMs] deserves acknowledgement. Last week, our path towards achieving a third-country “passport” to facilitate business in the EU took a further step forward when the European Securities Market Authority [ESMA] gave Bermuda passing grades on three key criteria, with further review and assessment to follow. These are the building blocks that set the foundation for proactive business development. These are the elements that help us attract more fund industry companies to our domicile. Successes like Centaur’s arrival are never a short-term fix; they’re more commonly the culmination of numerous work streams and many years of dedicated business-development efforts—from the first phone call made to our concierge service to the last ‘i’ being dotted or required signature gathered for regulatory registration. We are only now beginning to reap the benefits of multi-industry projects we’ve been refining in our pipeline since the BDA was established just over three years ago. Initiatives we’re working on now could take just as long to percolate and become reality. The groundwork and methodical implementation that pave the way for long-term, sustainable progress take patience, time and collaboration. It’s a long-term endeavour. The BDA has been working collaboratively on projects such as this year’s partnership law amendments, trust law reform and the recent introduction of limited liability companies [LLCs], as just a few examples. Similarly, we have undertaken pointed and specific research on exactly what products and services we should be targeting to attract investment from South East Asia. We have studiously examined how to attract more family offices and international arbitration work to the island. We have systematically implemented a strategy of attracting industry conferences to Bermuda so corporate decision-makers can experience the jurisdiction first-hand. All of this required time to develop and reach fruition. Yet success still comes down to core metrics—GDP and jobs. Bermuda turned a corner in 2015, and has now recorded more than five quarters of economic growth. We cheer that trend. We also celebrate every single job that is maintained in our market and rejoice over new jobs created when a company like Centaur opens for business. It’s true that post-recession growth doesn’t mirror the heady employment stats of the 1980s, ’90s and even mid-’00s, but every single job is an important victory. And, more often than not, each spurs continued hiring. Asset managers that started with one or two staff tend to progress to five or six; law firms that launch with a half-dozen have built teams of 20. Patience, determination and tenacity are a large part of this story. 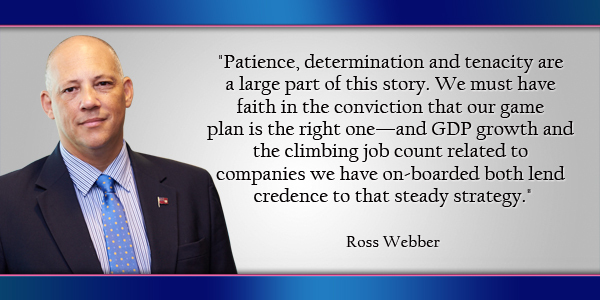 We must have faith in the conviction that our game plan is the right one—and GDP growth and the climbing job count related to companies we have on-boarded both lend credence to that steady strategy. The BDA will stay the course, and the country is already reaping the benefits. Column: Why Bring Conferences To Bermuda? This article is one of a series of good articles from the BDA. Keep up the good work. Hopefully you can stay above the political fray but keep all key politicians fully informed of your endeavours. Yep. Another good update that keeps it real. These guys are the real deal. Creating the plan, sticking to it and grinding it out. A very well presented update that should build confidence in Bermuda. Well done BDA.